We're happy to report that we have made our first tiny steel GALCIT rocket motor and successfully static fired it to thrust! build and validate prototype of small scale GALCIT melter based on a deep fryer: success! build simple steel GALCIT rocket motor and cast the propellant: success! static firing of the test motor: success! 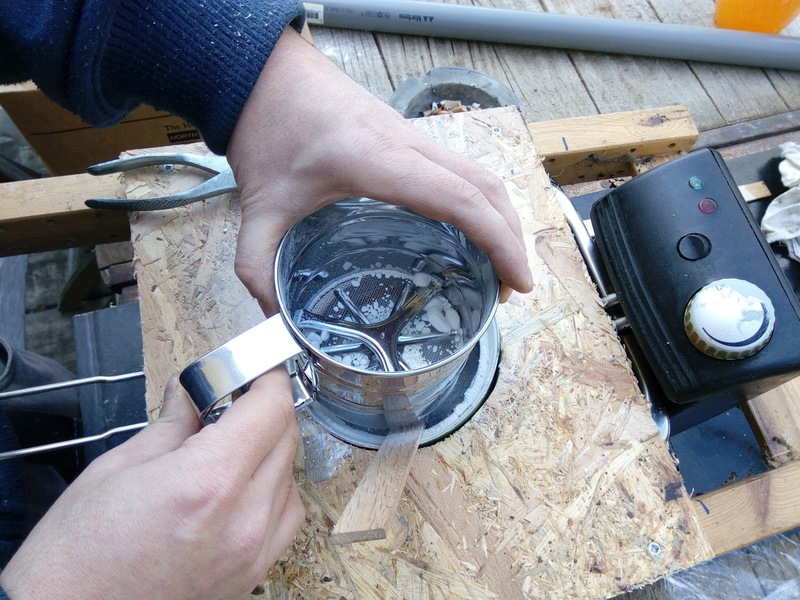 For this prototype of a small scale GALCIT propellant melter we used a standard deep fryer. 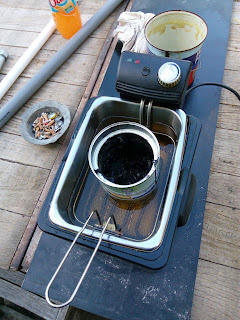 In the deep fryer we placed a used, cleaned metal paint can to use as the crucible of the melter. We left the metal net of the fries in to facilitate the handling of the crucible and to provide an extra barrier between it and the heating elements. Below is a picture of the melting of the asphalt/bitumen, the fuel component of the propellant. Before adding the oxidizer, we made a simple wooden cover plate around the crucible to prevent the oxidizer from falling in the oil. There is a small gap between the crucible and the cover plate which we plan not to have in the final version of the melter. The oxidizer had clumps in it, as expected. We ground and sieved the oxidizer with a standard powder sugar sieve and that worked very well. 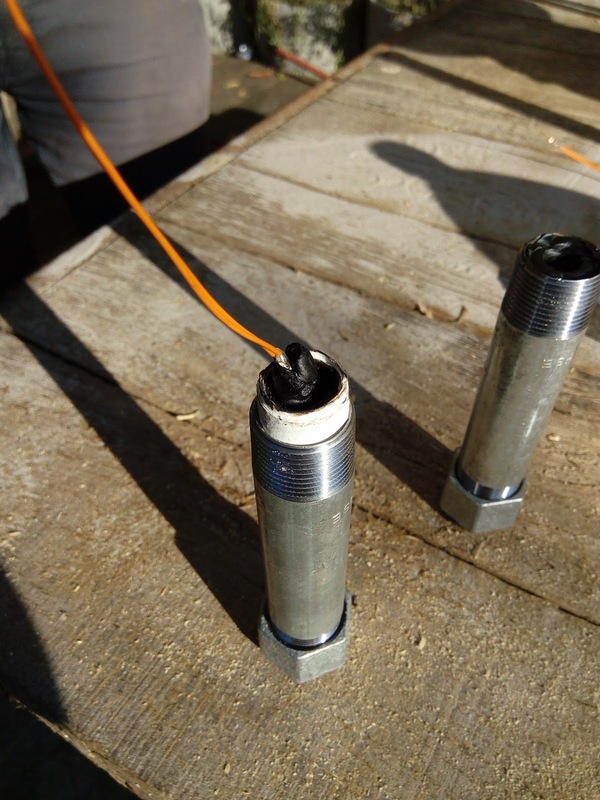 When measuring the temperature of the oil with an independent sensor, it was found to be 176 degrees Celcius rather than the indicated maximum of 190 degrees Celcius. This gives the propellant slightly more viscosity and makes casting in tiny motors (made out of narrow pipes) more challenging. For the motor we wanted to keep things as simple as possible. We used a standard 12cm pipe with threads at the ends so it can be closed off with 2 end caps. The cylinder needs insulation and/or cooling from the heat of the reaction. We used thick paper rolled into a cylinder to achieve ablative cooling and this worked nicely. Surprisingly, the material stood up during the incredibly long burn time. The diameter of the propellant grain is 18mm for the right one and 16mm for the left, which has thicker insulation. We need a nozzle, of course! Again using the simplest design possible, we went for an end cap with a hole drilled into the center. 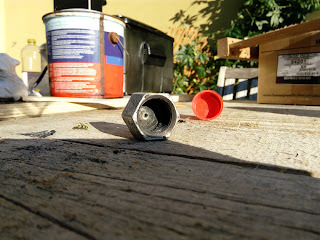 To be able to drill the hole into the exact center, we fixated the end cap with a reusable wooden holder. We drilled using a drill press. 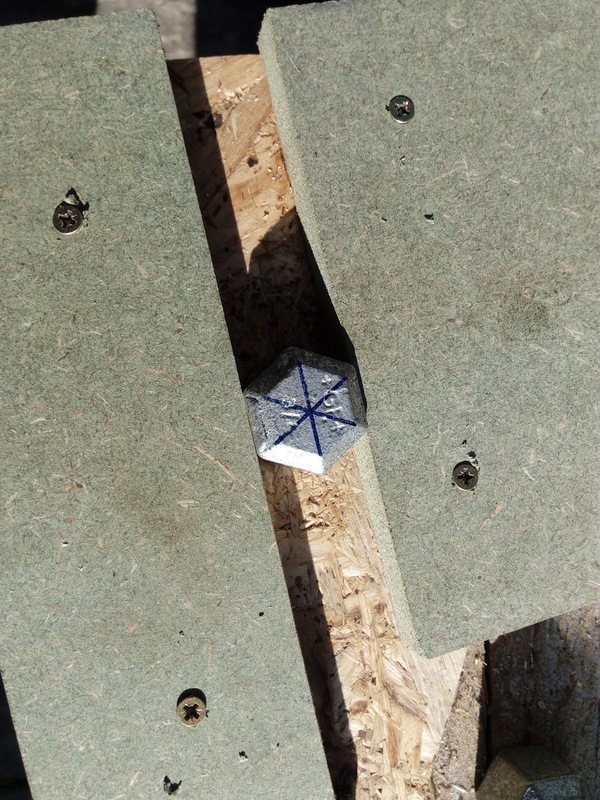 We chose the 3mm hole knowing that it is actually way too big rather than risking a RUD on the first firing test. It is expected that using this simple steel nozzle exit will result in severe erosion because the steel would not be able to resist to the heat of the exhaust for long. 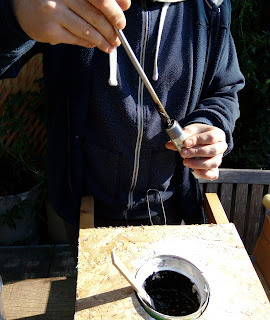 Casting takes some skill due to the aforementioned high propellant viscosity but we managed to cast it by letting it ooze down from a metal rod into the motor and pushing it down further with the rod. A standard electronic match was installed in the propellant, described previously. For the static firing, we mounted the motor inside a soft plastic bucket, full of with hard sand. The sand serves as a first sound, shock and shrapnel muffler and holds a small low-thrust motor in place very well. 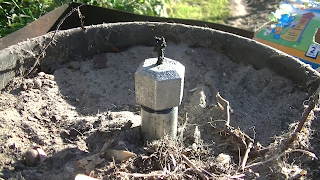 The motor was ignited remotely at a safe distance from behind with a 25cm thick brick wall. 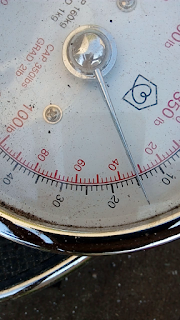 That's a burn time of 3 minutes 29 seconds for a 12cm motor, which is huge! 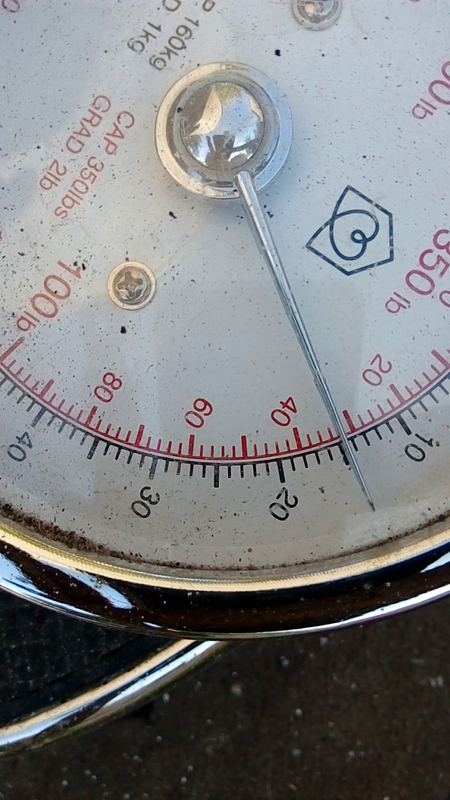 From this low burn rate (0.57mm/s) is clear that the motor chamber was severely under-pressurized, as intended. 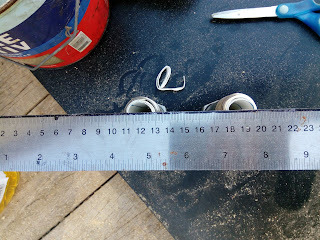 We measured the thrust with a simple scale. Not very accurate, but enough to verify that the motor was able to generate thrust. From image analysis, we estimate the thrust to be around 1-2 Newton. Some thrust was measured, estimated at 1-2 Newton. In the future we'll measure the thrust more accurately and we obviously intend on generating a lot more thrust. As mentioned, we burned through 120mm of propellant in 209 seconds so that's a burn rate of around 0.57mm/s and we are aiming for a burn rate that's at least 40 times higher. All of the GALCIT burned away and the motor was found to be empty and almost clean. 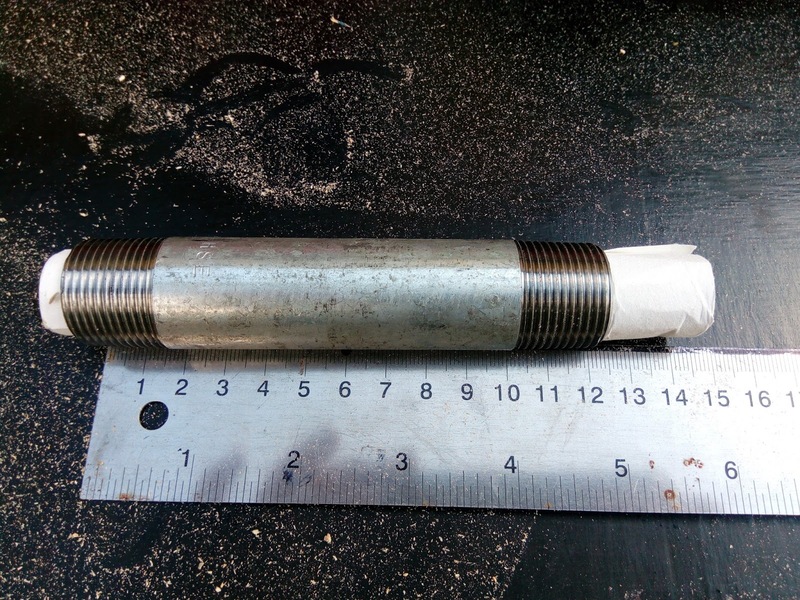 Only minor nozzle erosion was observed, which may be due to the low pressure and exhaust velocity. 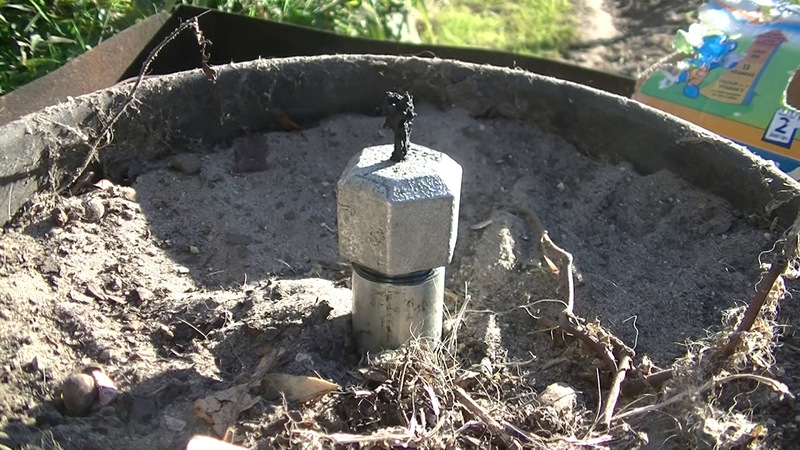 It was observed that threads of the nozzle end cap had a slightly darker color up until halfway of the thread and some black residue was present. This leads to the conclusion that some gas slowly crept through the threads over the duration of the burn. This is expected because we are not using any o-rings or sealing mechanisms for the pressure vessel other than the thread of the pipe. The same pipe filled with water would also start leaking without some seal (such as hemp fibers) on the threads. We observed an interesting (and unexpected) residue buildup at the nozzle exit. We're not sure yet what the residue is composed of. It may be leftover or incompletely burnt propellant, eroded steel, ash or a mixture of a bit of everything. The sharp edges of the nozzle hole and the small diameter of 3mm might contribute to the buildup of this material at the nozzle exit so this may go away by itself as we transition to smooth nozzles and/or bigger motors. The experiments went very well and being able to make a basic functional steel GALCIT motor was a milestone that we really needed to pass. The prototype small scale GALCIT melter also worked adequately well so we will be able to use it for future small scale experiments and tests.